I made this potato salad today! So easy it’s awesome!!! And so easy!! That’s great – thanks Diane! Hi Glinda – sounds like your pressure cooker was not reaching pressure properly. Did you see a lot of steam coming out around the sides of the lid? Did you lose a lot of water while it was cooking? 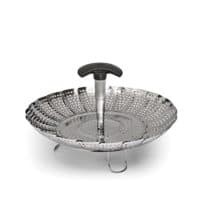 What type of steamer basket were you using? Have you tried hard boiling eggs just by themselves? I have tried just boiling eggs once and those did not turn out for me then either. The recipe was from another site but I do not remember the timing. I guess I will find out next time I cook anything if it’s not coming to pressure properly. Thanks! Sorry you’re having problems Glinda. 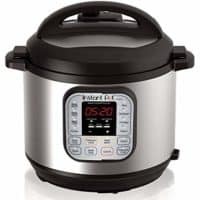 This recipe has been made successfully so many times by so many people that I am confident that the problem is not with the recipe but problems users are having with their pressure cookers. Thanks for the link to the basket. I don’t think that is what’s causing your problem. 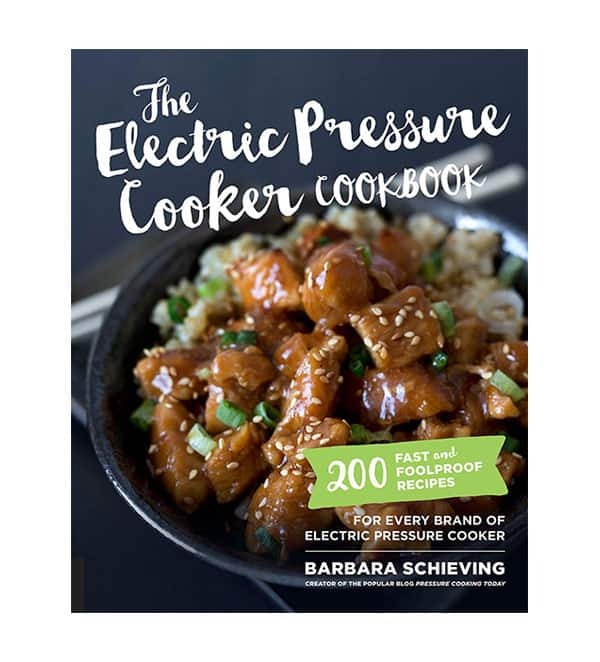 Hopefully you’ll be able to resolve your problem with your pressure cooker soon. Thanks, Barbara. I’m sure it’s not the recipe either since so many people have had great success. I used my pressure cooker twice using recipes I’ve previously used and both of those came out the same as usual. I think I will try just the boiled egg recipe again using your recipe and see if I have better luck with the eggs. But even the comments under that recipe seem to indicate timing for everyone can be different. I must have done something wrong on the potato salad recipe that I just can’t figure out. Thank you. My potatoes were gummy. I accidentally left in 15 min. more than needed. Do you think that was the issue? Otherwise, putting in the eggs at the same time was genius. Thanks! It is awesome and so much quicker to cook the eggs at the same time. Yes, the timing on this recipe needs to be followed closely for best results. Can I do this without a steamer basket? Hi Casey – you can do it without a basket. The potatoes have a nicer texture when they’re steamed and not boiled in the water. So, eventually, you’ll want to get one. Some have stacked the potatoes on the steamer rack/trivet that came with the pressure cooker. One way to steam potatoes I have noted from recipes is an aluminum foil packet, if the steamer rack/trivet does not work, this method may help if wrapped correctly. Hi Tiffany – you can make a basket out of foil and poke some holes in it, but if you wrap the potatoes in foil it will slow down the cooking. 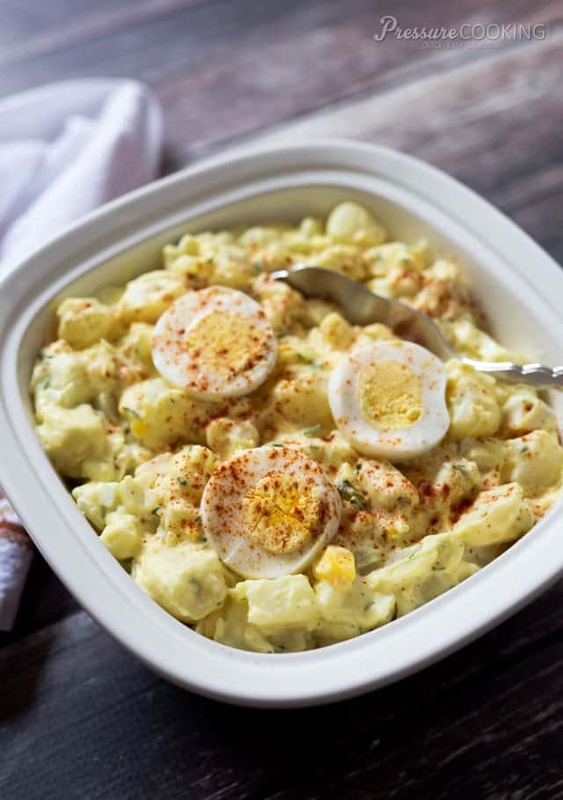 Love the taste of this potato salad and cooking the eggs at the same time! But my potatoes were “sticky” not creamy. I followed the recipe, cooking directions, quick release, etc. What did I do wrong? Hi Karen – your potatoes weren’t creamy after you added the salad dressing mixture? Did you need more? I halved the recipe and subbed dried dill for the pickle juice. It was fantastic! Thanks! That’s great – thanks Kelly! Tried this. easy to make the potato should of been cooked longer to be right for me. The eggs turned out good, I cooked the eggs and potato’s separate. Hi Andy – Next time try cutting your potatoes smaller. No need to cook the eggs separately. It really is an easy way to make potato salad. I’m going to make two batches of this for our company Thanksgiving potluck! Do you think it’d be ok to make it the night before the event? Hi Doug – definitely! In fact, I think it tastes even better the next day. 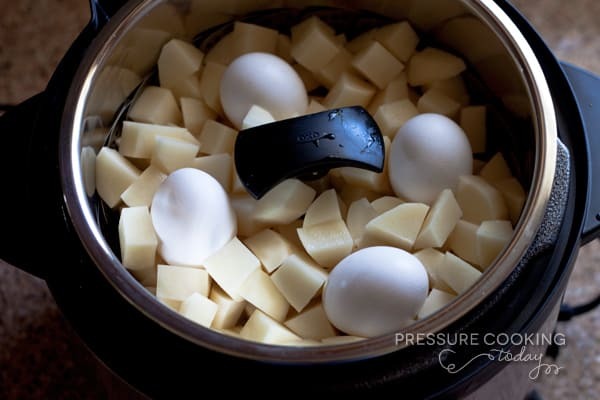 I love how easy this is in the pressure cooker – such a great recipe! 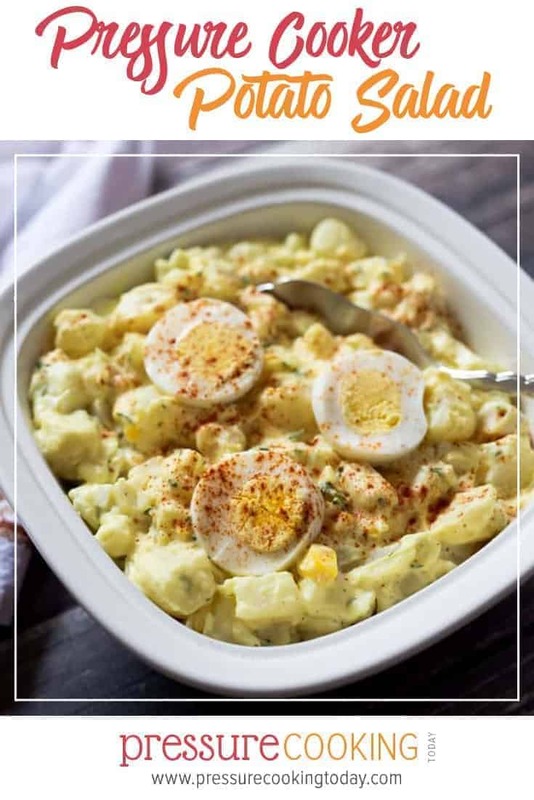 What an easy way to make potato salad! It was a big hit in my house! Thanks for your recipe! I am constantly amazed by everything my Instant Pot can do! 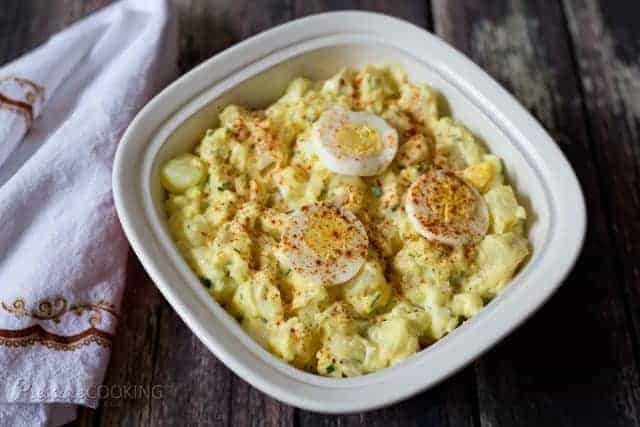 This potato salad is perfection! So easy to make! I love it! I LOVE that I can make this in the pressure cooker, and it turns out great! I never knew you could make potato salad in the pressure cooker! I love doing double duty with cooking the potatoes and eggs! Hi ! I was wondering If I can use the eggs straight from the fridge or they must be at room temperature? Hi Monica – use eggs straight from the fridge.